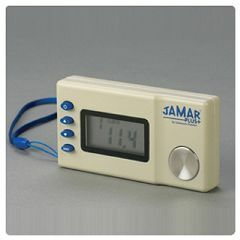 AllegroMedical.com presents The Jamar® Pinch Gauge - Plus+ Digital - 50 Lb. Capacity. Jamar® strength evaluation instruments offer accurate and repeatable measurements. Maximum strength indicator remains after each reading until reset. Registers in pounds and kilograms. The Jamar® digital pinch gauge offers accurate and repeatable pinch strength readings (tip, key and palmer). It has an easy-to-read LCD display. It also has a push-button console that includes a button to zero last reading stored and two toggle buttons used to accurately store up to 99 readings. There is a wrist strap and one 3V battery included. Registers in pounds and kilograms.